This very cozy Cafe has had the same name for close to a decade and several different owners while maintaining a constant tradition of excellent food. The original proprietor went on to start Cafe Istanbul at Easton. The current owners are a very nice Lebanese couple. The husband cooks and the wife serves as hostess. 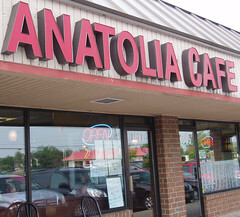 The quality is as good as or better than the previous versions of the Anatolia Cafe. 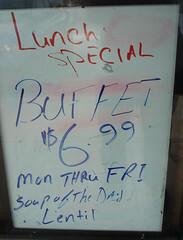 A new addition is a great lunch buffet at a reasonable price. The Cafe is hidden in a declining strip mall nook in suburban sprawl, but if you are close to the area. the trip is well worth the effort. 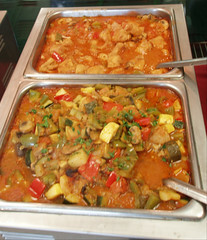 The buffet consists of soup (often a delectable lentil), salad, six buffet items which include rice, gyro meat, and a varied selection of four entrees from the menu as well as a couple sauces, pide (bread) and dessert (usually rice pudding). The staff is always friendly and quick to keep your water glass full. The rice pudding is the best that I have had locally and their custard may be perfect. All of this for $6.99. 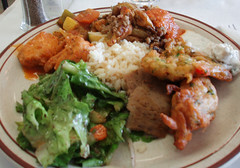 After trying out the buffet a couple times, I suggest heading back for the lunch or dinner menu. The best item to get is the appetizer sampler (small – $10.95, medium – $14.95, large – $23.95) consists of babagannush, hummus, stuffed grape leaves, tabouli, ezme salad, eggplant with sauce and lebni (yogurt with walnuts, garlic, and dill). The small feeds two people very easily. This nugget in a nook is worth the trip. This entry was posted on August 16, 2007 at 2:41 AM	and is filed under CLOSED, restaurant reviews, restaurants. Tagged: Anatolia Cafe. You can follow any responses to this entry through the RSS 2.0 feed. You can leave a response, or trackback from your own site. Anatolia Cafe is great! I am glad to see it getting recognition. 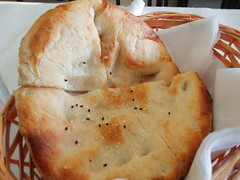 A similar place I like is Pomegranate Mediterranian Cusine on N. Hamilton Rd (acrosss from Meijer) in Nothrern Gahanna. No buffet (yet? ), but good food. Yum, yum, yum. This is not your typical “Hey, we just started a buffet” offering. Each selection could stand alone as a satisfying entre. Great “delectable lentil” soup, warm bread(homemade, I believe). Nice music, great service, niiice price. Felt like I was in Instanbul again (If I had ever been to Turkey or if Instanbul had strip malls with UDFs). All that, AND I was able to dine with the CMH Gourmand himself. I’ve Googled a few times since driving into the plaza the Friday before Memorial Day. I drive through the intersection north of the strip mall a lot but had not been by after dark. I drove by and was alarmed that there was no light in the windows. I keep hoping I will find they have moved to a better location. CG Reply: Maureen, I am sorry you had to find out the hard way. I did too just before I left on vacation and did not have time to update. The Cafe and the name have a long history. The first owner, moved on to Istanbul Cafe at Easton. The Cafe has had several owners in the last three years. The last couple versions had great service and food. The most recent version was so-so but working to improve. So – no Turkish Buffet for you…or me. The legacy seems to be over for this spot.